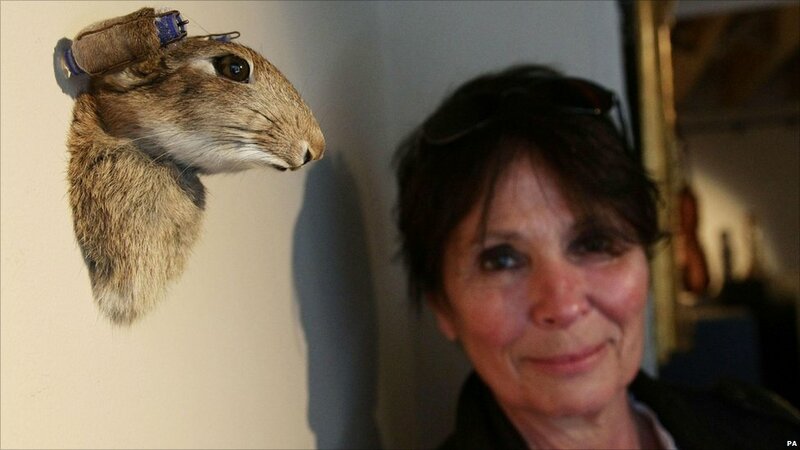 For her artworks, Fouts (pictured) often marries together two unrelated objects, leaving the viewer to interpret their meaning. Fouts (pictured) says: "I hoard stuff in boxes and then I lay it all out and many ideas happen like that." Fouts re-engineers her chosen objects, transforming each one into a surprise version of itself. She says: "It's not deep, but it is entertaining and it makes people smile." 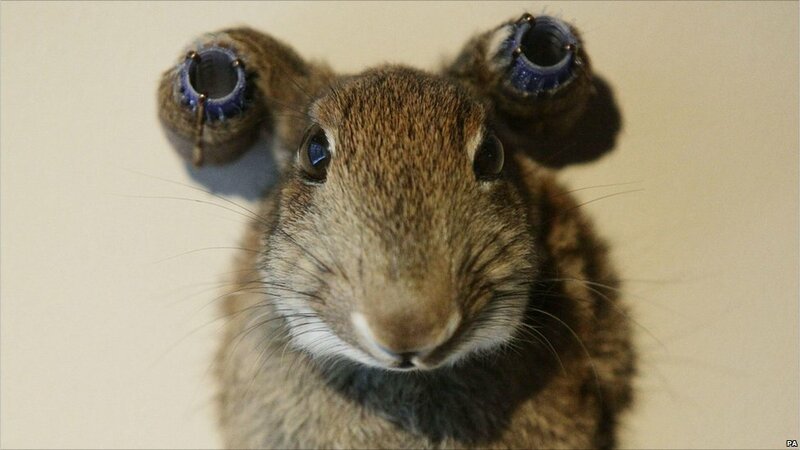 Photo: Rabbit with Curlers (2010). Fouts often explores the theme of freedom and release using stuffed mice and birds. The Pertwee, Anderson and Gold gallery launched in February inside a former Soho recording studio and is run by the actor Sean Pertwee and Simon Anderson and James Golding. 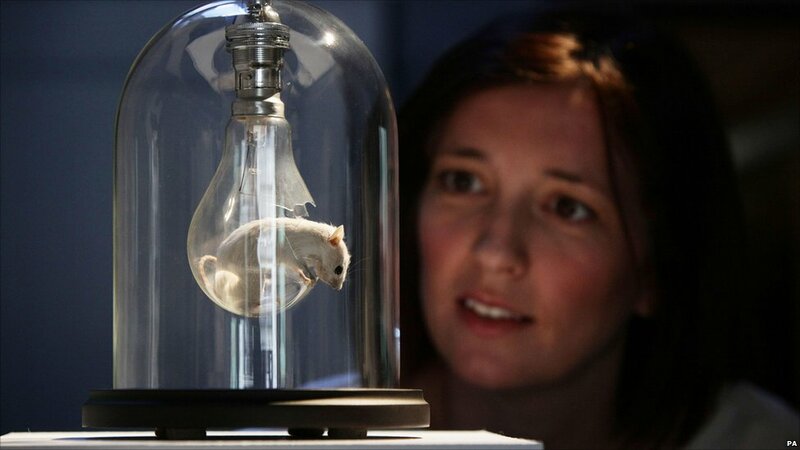 Photo: Mouse Bulbs Series, Dave (2011). Sean Pertwee (pictured) says: "What I love about Nancy's work is way she makes the ordinary extraordinary, and her humour. Everything she does is beautifully engineered and made." 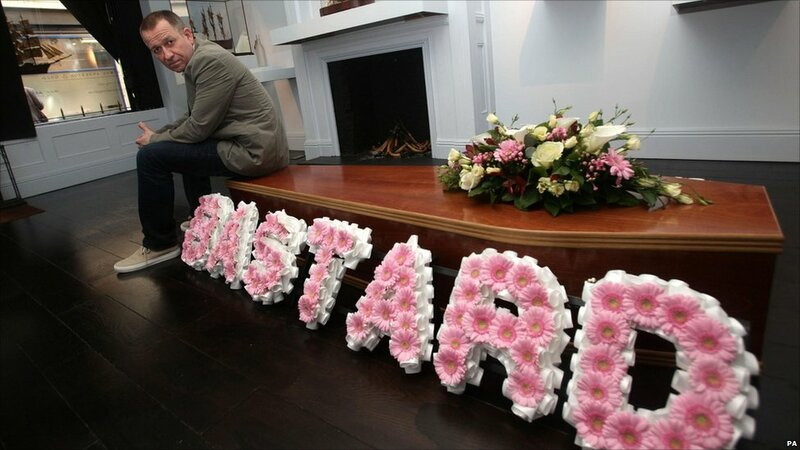 The coffin in the photo forms a central part of the exhibition, and was driven round London in a hearse earlier this week as a publicity stunt. The son of the late Doctor Who actor Jon Pertwee adds: "My father was a big collector so I've always appreciated art, and I thought I wanted to be an artist at one point but I realised I was far too happy!" 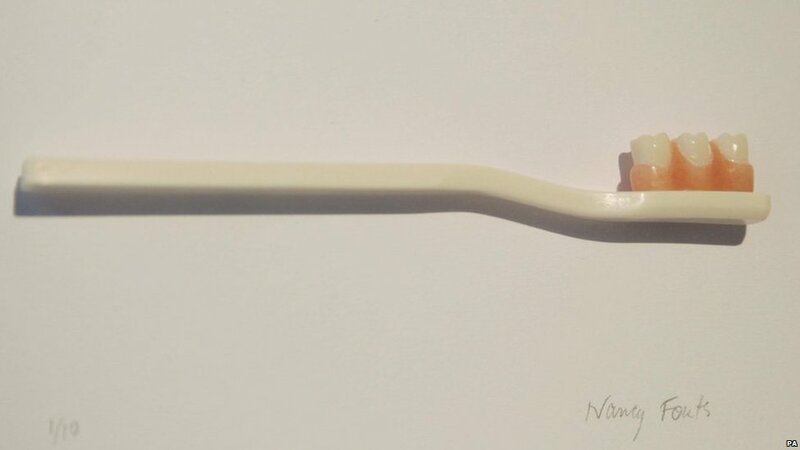 Photo: Toothbrush (2010). Nancy Fouts says: "My work is not a comment on religion, nature or indeed anything, it is all about manipulating the object to realise my idea. Everything starts with the idea." 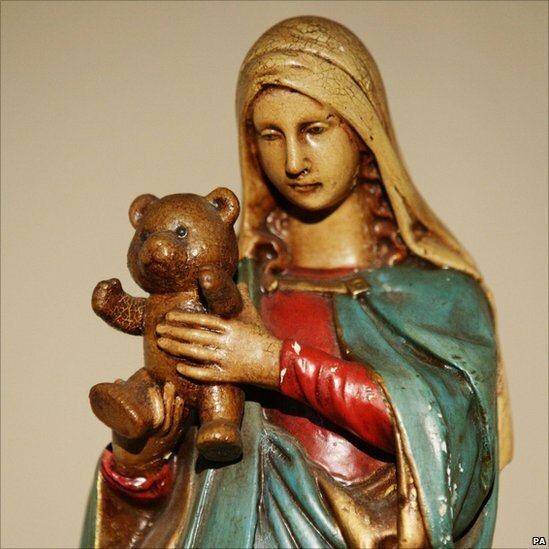 Picture: Madonna and Teddy Bear (2010). 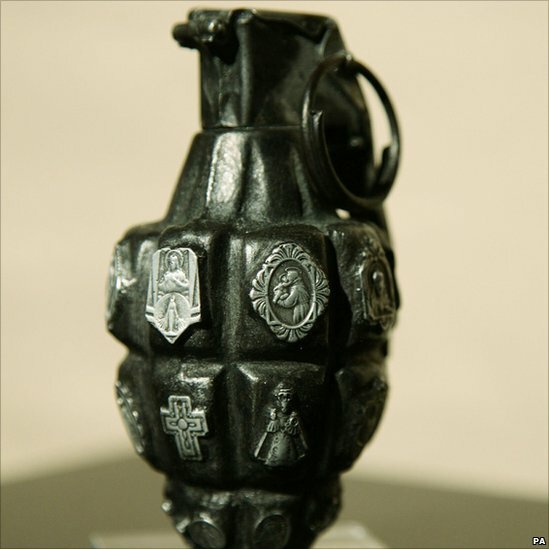 In Holy War (2010), religious motifs have been added to a sculpture of a hand grenade, juxtaposing religion and conflict. Artist Nancy Fouts lives in London and studied at both the Chelsea College and Royal College of Art. 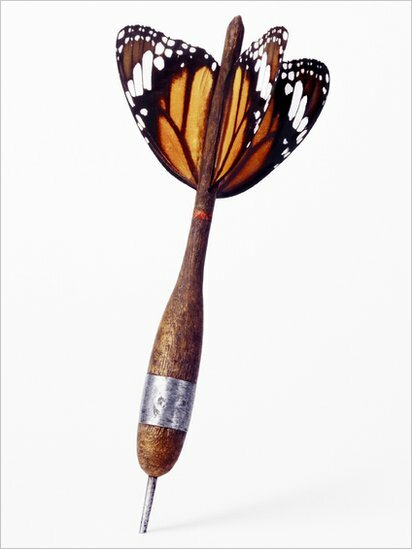 In Butterfly Dart, the flight of a dart is crafted from the delicate wings of a butterfly, transforming an everyday object into a thing of fantasy. The exhibition, Un-think, opens at the Pertwee, Anderson & Gold gallery in Bateman Street W1 from Friday 8 April.